Jose Canseco's Twitter account is equally as embarrassing as his book - and his spelling could use some serious fine tuning. McGILLIGAN: Stand and fight for the truth. Don’t let any person or group of people take advantage of you. Fight the liars and hypocrites. Good and honest people suffer too much. This sounds like the musings of a slightly unpopular high school student who just started a blog. They are not. 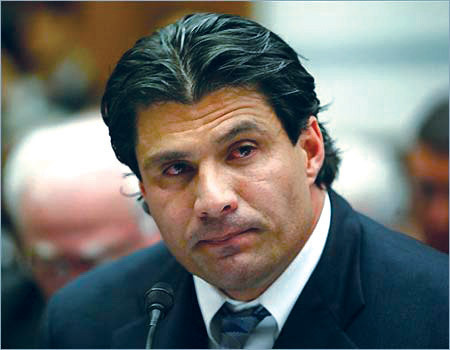 Those earnest ramblings come from the mind and thus twitter account of my childhood baseball hero: Jose Canseco. Time, no baseball and no inner filter from thought to keyboard has produced one of the oddest and most strangely fascinating twitter accounts in recent memory. He’s part terrible sage, educator, quiz master and well, who knows what else. What I do know is this isn’t the man I idolized growing up, but then again I was basing most of that on the cover of a Topps baseball sticker album and his 40-40 season of 1988. Analysis: It obviously isn’t an English class as his commas are in the wrong place. I like that he quickly corrected himself and asked his followers (almost 450,000, how scary is that) to hit a hater rather than a gardening tool. Analysis: Perhaps this is the poetry section of that class he was referring to. 19 hours ago – So if people who tell the truth go to jail that only means one thing. If you havnt been to jail or prison you’re a liar ,right. Analysis: Grammar is still atrocious. This tweet was in response to a person (@eduardo1garcia) who referred to him as a snitch. The person called him this because Jose asked why our prisons and jails are overpopulated. Got to side with Jose on this one, his being a snitch on baseball’s steroid era has nothing to do with prison overcrowding. Barry Bonds and Rafael Palmeiro are still free men. Well done @eduardo1garcia, you’ve made Jose look logical, not an easy task. Analysis: This is what I like to call Professor Jose, he’s dropping knowledge in the form of questions. My favourite response is the guy who asks if the gun is parallel to the ground and Jose says it is. He then goes on to say he’s shocked that no one got the answer. I have to agree with Jose, its an easy answer because if the gun is parallel to the ground then the nickel would hit the ground first as the bullet would travel quite a ways before losing momentum and falling to the ground. Wait, someone got it…. 18 hours ago – Gary root got it ,the answer is at the same time big hug for Gary. Analysis: Sorry, there will be no hug for Gary. His answer was completely incorrect and the fact Jose thinks its right and couldn’t believe no one got the answer before Gary is awesome. On a side note, there’s a lot of racist remarks thrown out by Jose’s twitter followers. Analysis: I have no idea, this isn’t in response to anything or anyone as far as I can tell. Analysis: This fact is not attributed to anything and anyone. According to Jose’s logic that means every third person you see is capable of doing something unbelievably evil or has a severe drug and/or alcohol dependency. It must be terrifying to live in Jose’s neighbourhood. Apparently it’s filled with alcoholics, murderers (I’m assuming this is what he meant to write), rapists, drug addicts and child molesters. You know who doesn’t live in Jose’s neighbourhood? An elementary school grammar teacher. Can’t say that I’m surprised that he’s not a very bright person.